Fans of big numbers got another treat out of Apple (AAPL) this week. The tech giant announced that it sold 3 million new iPads over the weekend -- a new record for its tablet line. Apple didn't release a debut weekend tally for last year's iPad 2, but the original iPad took four weeks to clear its first million units. Apple clearly has been picking up the pace since then. It sold a whopping 15.4 million iPad 2 units during the holiday quarter, even though many customers probably knew that an updated tablet would be just a couple of months away from hitting the market. So, yes, the new iPad is a hit. "Of course," you say, but there were plenty of cynics who didn't expect to see it that way. There were more than a few skeptical bloggers and financial trackers worrying that physical counts of shoppers lining up at flagship Apple stores were lighter than usual. Some Apple watchers were also concerned that channel checks of area stores found the iPad still available for walk-in traffic buyers late into the first day. Was Apple losing its touch? No. Unlike the iPad 2, which sold a mere 300,000 units on its first day due to supply shortages, Apple was ready for buyers this time. There's less art and more science for Apple with the iPad. If it sold 15.4 million iPads in its latest quarter, how can the enhanced tablet -- at the same price point -- not sell briskly? Apple is only constrained by the limitations of manufacturing, and now it's had three years to get the tablet right. We also can't ignore the important of online retail. More and more consumers are shopping for Apple products online and having them delivered directly. 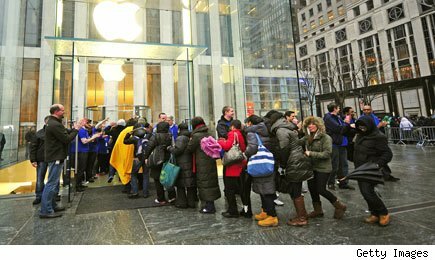 There may be a certain allure to hitting up the local Apple Store on a new iGadget's launch, but avoiding crowds and long lines is even more important for a growing number of shoppers. There's a good reason why Apple made sure that it had plenty of tablets to go around. A year ago, the iPad 2 didn't have a whole lot of competition. Many of its rivals -- including the Samsung Galaxy Tab and Motorola's (MMI) Xoom -- launched at high price points. It's a different environment facing Apple's tablet line now that Amazon.com (AMZN) and Barnes & Noble (BKS) have entry-level 7-inch tablets at $199. Apple doesn't have the wiggle room to play it cute and hold back on its supply. If folks can't buy a new iPad now, they may have something else a few weeks later. There are 3 million reasons to respect Apple's new iPad. Longtime Motley Fool contributor Rick Munarriz does not own shares in any of the stocks in this article. The Motley Fool owns shares of Amazon.com and Apple. Motley Fool newsletter services have recommended buying shares of Amazon.com and Apple, as well as writing puts on Barnes & Noble and creating a bull call spread position in Apple.